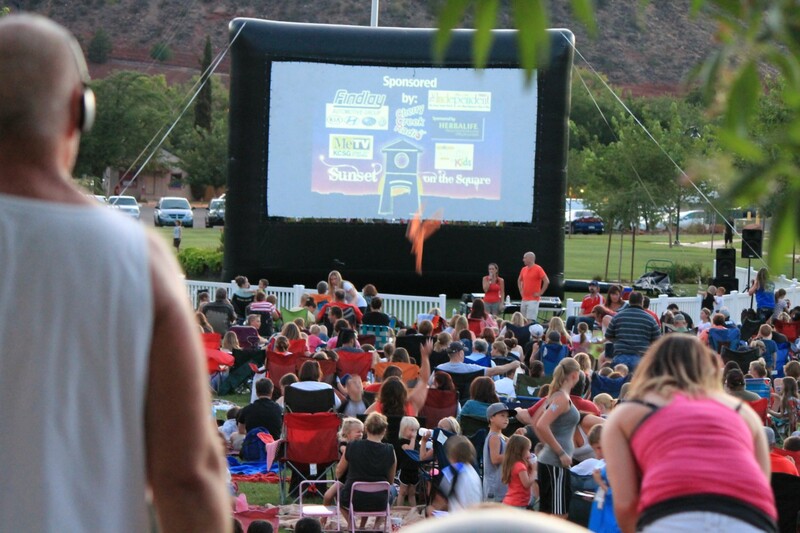 Southern Utah’s best loved summer movie series returns to Town Square Park May 22, 2015. Sunset on the Square, Friday night FREE family movie series is pleased to announce this 2015 season movie list. The program is located at Town Square in the heart of St. George and is now in its 7th year of providing quality family entertainment to locals and tourists alike. The summertime series is hosted by Write It Up! and the City of St. George. Sunset on the Square is held the second and fourth Friday of the month, May 22, 2015 through August 28, 2015. Each event features a FREE movie in the park under the stars, games, prizes, food, face painting, the Dealer Collision Water Balloon Challenge and dancing. 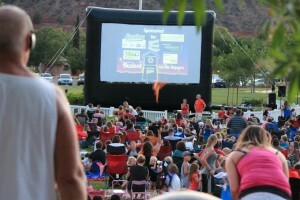 Movies will start at dusk, but the fun will begin around 5 at Town Square Park. The Friday night FREE family movie series plays on a giant outdoor movie screen out under the stars and beautiful Southern Utah skies. Each event is led by local business owner Dawn McLain who explains, “Sunset on the Square has become a staple event in St. George. We’re known for family friendly fun, prizes, movies and so much more. Over the years I have really enjoyed watching our young Sunset on the Square fans grow up, and I look forward to seeing them throughout the summer.” SOTS has been a huge success drawing large crowds at each movie, especially special event nights such as this years’ Season Kick Off, Nonprofit Night, Pioneer Games and St. George Chamber Night. May 22 Big Hero 6 PG 93 min. June 12 Mr. Peabody and Sherman PG 92 min. June 26 Willy Wonka & the Chocolate Factory G 98 min. July 10 Lego Movie PG 100 min. May 22 – Season Kick Off: Pre-movie events include the Girls On the Run 1st Annual Race (Approx. start time will be 4:30 to 5:00) and the Zloop Country Showdown presented by Cherry Creek Radio (Approx. start time will be 6:00). The City of St. George will also be featuring a new program launching in recognition of and in conjunction with National Bike Month (May). The program is called Bike In Downtown and will feature the Active Transportation Committee offering FREE valet service to all residents who bike in for the evening’s festivities. In addition, all bikers will receive exclusive downtown coupons! June 26 – Nonprofit Night: Discounts & spotlight for nonprofit organizations to help promote their mission and vital programs and services they provide in our communities. For more information about Sunset on the Square or to sponsor or purchase a booth please contact Dawn McLain, Event Coordinator at 702-860-2341 or dawn@writeituponline.com. The Sunset on the Square movie list and details can also be viewed online via the City of St. George website at: www.sgcity.org. Join us every 2nd and 4th Friday of the month May 22 thru August 28, 2015.